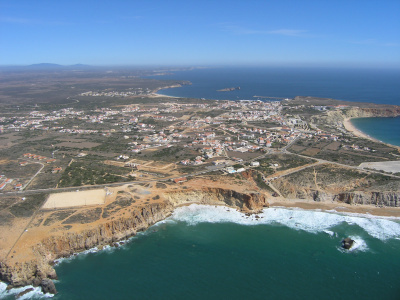 The Sagres Region is marked by its mystical atmosphere and its unspoilt, dramatic landscape, where the sea and the hills come together creating a unique heritage. The natural beauty of its beaches, many of which are practically empty, the soaring cliffs in direct contact with the sea, and the wealth of local historical heritage are the main hallmarks of this region. The local population still dedicates itself to traditional activities such as fishing and farming, guaranteeing a rich local cuisine. A whole range of sports and leisure activities can be pursued, such as fishing, surfing, diving, walking, etc. It is one of the few places in the Algarve where untouched nature and a rich historical and cultural heritage remain intact. This coastal region should only be visited by those who enjoy discovering the best path to follow for themselves, who don’t mind having to turn back halfway along a dusty trail and relish the challenge of finding a pathway through the cliffs to reach an alluring and sandy beach. Unspoilt natural beauty, Rugged beaches, Peaceful bays, Unique, untouchable landscapes, Nature at its purest (sunsets, the moon rising, the smell of the country), and all of this complemented by a profoundly rich Historical Heritage of international significance. The Natural Park of the Costa Vicentina is over 80km long and encompasses 76 000 hectares of natural landscape containing more than 100 different species of flora considered to be endemic, rare or highly localised, and a significant number of threatened animal species. While there, visitors might be spot an eagle, a lynx, otter, fox, hedgehog, to mention but a few animals. There is an intoxicating combination of the fragrance of the local vegetation and the intense smell of the sea. In this municipality alone, there are 25 beaches, suited to all tastes. The features of the local landscape mean that a wide variety of sports activities can be pursued, including trekking, sailing, boat trips, fishing, diving, windsurfing, surfing, kite surfing, bird-watching and golf. All of these are available in just one area.